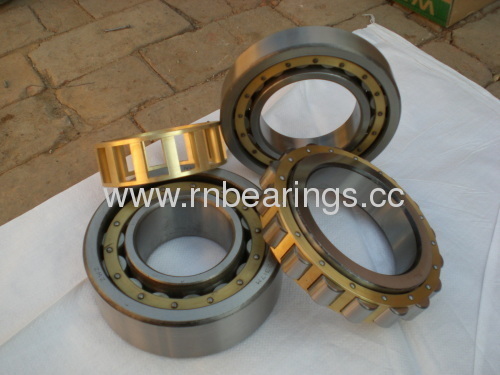 The rollers in a single row cylindrical roller bearing are always guided between the integral "open" flanges on one of the rings. These "open" flanges combined with the specially designed and surface treated roller ends, provide improved lubrication, reduced friction and consequently lower operating temperature. The ring with the integral flanges together with the cylindrical roller and cage assembly can be separated from the other ring. This results in easy mounting and dismounting, particularly where the load conditions are such that interference fits are required for both rings. The outer ring of bearings of the NUdesign (fig) has two integral flanges and the inner ring is without flanges. Axial displacement of the shaft with respect to the housing can be accommodated in both directions within the bearing itself.The bearings are therefore used as non-locating bearings. For manufacturing and maintenance reasons, the two outer ring flanges of large-size bearings of the NU design which are identified by a Drawing No. may not be integral but take the form of loose flange rings.